A bestselling, portable kit featuring concealer to lighten up under-eye darkness and a pressed powder to set makeup for lasting wear. Like an instant eye lift, Bobbi Brown's Creamy Concealer features skin-smoothing emollients and silica for seamless blending and a soft-focus effect. 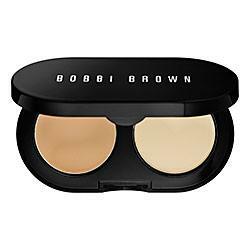 Bobbi Brown Creamy Concealer/0.05 Oz.